This is a silver ornament. 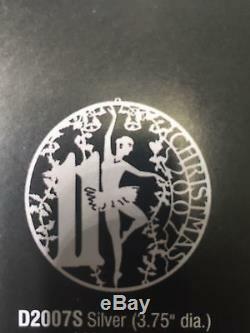 The ornament features a ballerina with the words Christmas 2007. This is a collectible item. The ornament is store stock that has never been used. It will arrive in the original packaging. Since 1970 the Biedermann Commemorative Christmas Ornaments have been handmade by the artisans of Schwaebisch Gmuend, Germany for centuries the center of brass, silver, and gold ornament cutting in Europe. The item "Biedermann Silver Ornament Annual Christmas 2007" is in sale since Tuesday, June 21, 2016. This item is in the category "Collectibles\Holiday & Seasonal\Christmas\ Current (1991-Now)\Ornaments\Other Current Tree Ornaments". The seller is "grossepteshop" and is located in Grosse Pointe, Michigan. This item can be shipped worldwide.